During the first 9 months of this year the world’s 24 largest car makers registered/sold/delivered around 57,17 million cars, up by 0,8% from the volume seen during Jan-Sep 2014. The total would grow up to around 62 million including some Chinese brands that don’t communicate their results. The number is based on the quarterly financial results published by most of the auto makers, and allows to have a better picture of how global car market is dealing with the Brazilian and Russian collapse, the Chinese slowdown and the European come back. The results for the third quarter indicate that the 24 companies sold 18,37 million units, up by 0.74%. The figures include the results reported by BMW Group, Daimler (cars only), FCA, Ford Motor Company, Geely Automotive, GM, Honda Automotive, Hyundai Motor, Jaguar-Land Rover, Kia, Lada, Mahindra Cars, Mazda, Mitsubishi Motors, Nissan Group, PSA Group, Renault Group, Ssangyong cars, Subaru, Suzuki Auto, Tata Automotive, Toyota Motor Company, Volvo Cars and VW Group. Some of them are closely related: Geely and Volvo, Hyundai and Kia, JLR and Tata, Mahindra and Ssangyong, and Renault and Nissan. Other important car makers such as Chery, Lifan, Landwind, Great Wall and the Iranians were not included due to lack of information. September 2015 YTD figures show that all of these companies sold 57,4 million cars, up by 0,60%. The low growth is mostly explained by the difficulties the big players are facing in China, the collapse of Russian and Brazilian markets and the slow down in growth posted by US car market. All of these facts have had a negative effect on Toyota, VW and GM, the world’s largest car makers. All of them sold fewer cars in September 2015 YTD than during the same period of 2014. The scenario is getting so complicated that VW lost the position gained by June 30th when based on its global sales, it outsold Toyota and became the world’s leader. They are not alone. Hyundai and Kia, and PSA posted lower sales as well, while FCA remained almost unchanged. Honda, Ford and Nissan were the top winners during the first 9 months due to better conditions in India (in the case of Honda), and Europe (Ford and Nissan). 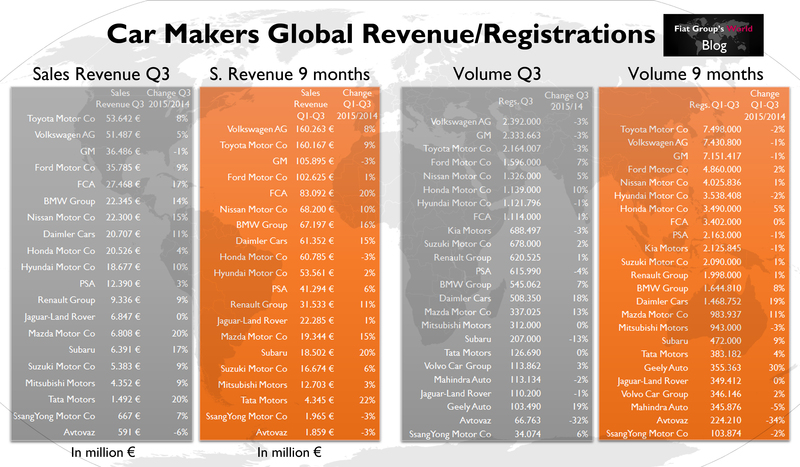 Outside the top 10, there were only 3 groups to post double-digit growth: Daimler, Mazda and Geely. Subaru and BMW had also important positive changes. In the opposite side there were Avtovaz (Lada), with massive loses due to the Russian car market crisis, and Mahindra/Ssangyong and Mitsubishi. Toyota registered the highest revenue with 53.6 billion euros during the third quarter, up by 8%. Notice that the revenue increased despite the fall on the deliveries so the average price per vehicle delivered jumped from 22.145 euro to 24.788 euro. Of course this is just a mere calculation based on total revenue and total deliveries, and doesn’t exclude the revenue coming from other activities different from the automotive business such as financial services. VW Group occupies the second position with 51,5 billion euros or 21.525 euro/car. GM goes next but its revenues are quite far from Toyota and GM’s values. The American giant posted revenues of 36,5 billion euros, down by 1%, and very close to Ford’s results of 35,8 billion euros. Actually GM cars posted the lowest revenue/delivered-car price in the top 10 during 2015-Q3. While at 8th place in the ranking by units delivered, FCA occupied the 5th place in terms of revenue thanks to the Jeep and Ferrari cars that allowed to have the fourth largest revenue/delivered-car price in the top 10, after the premiums and Toyota. Jaguar-Land Rover posted the highest ratio with more than 62.000 euros/car. 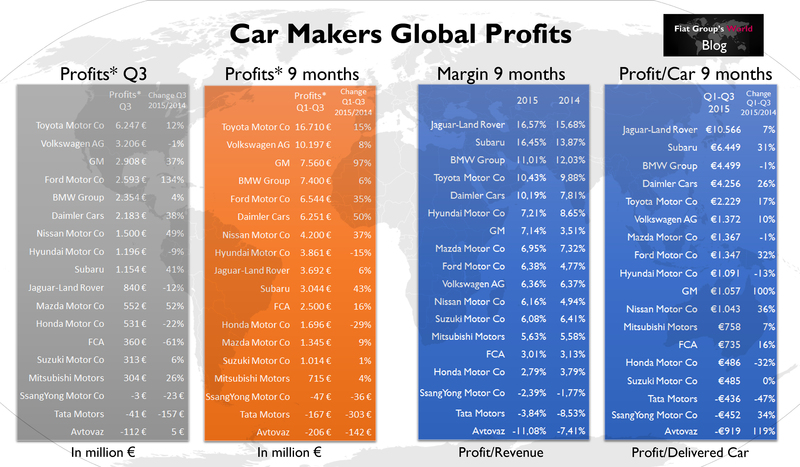 * As not all car makers disclose their profits in the same way, the analysis considers only the EBIT and Operating profit for the companies listed. EBIT data for BMW, Daimler, FCA, GM and VW. Operating profit for Ford, Honda, Hyundai, Jaguar-Land Rover, Mazda, Mitsubishi, Nissan, SsangYong, Subaru, Suzuki, Tata, Toyota and Avtovaz (Lada). 18 car makers published their profits information and there are some differences between the way they calculate them. Therefore this analysis includes only the EBIT or Operating Profits, which are not the same but is the closest way to have a sort of comparison between them. During the third quarter Toyota reported a 12% increase in profits to 6.2 billion euros, the world’s highest in the automotive industry. However it wasn’t the highest margin (EBIT or Op. Profit/Revenue) of the list, as this ranking was topped by Subaru (more than 18% margin), Jaguar-Land Rover, Toyota, Daimler Cars and BMW Group. Lada, Ssangyong and Tata lost money in 2015-Q3. For each car delivered Jaguar-Land Rover earned 7.623 euro. FCA earned only 323 euro. Note 1: all the information contained in this article was taken from the official quarterly reports published by the car makers in their corporate websites. All values are expressed in Euro using November 2015’s currency exchange. Note 2: Daimler Cars excludes the vans and trucks division. Note 3: Honda’s volume is the result of total unit sales of completed products of the company, as stated in the financial reports. It excludes the motorcycle division. Note 4: Suzuki figures include only the automotive division. Note 5: Toyota’s volume is referred to consolidated vehicle sales. Note 6: Avtovaz figures include only the registrations in Russia and Kazakhstan.